Hawaiian geese are found only in the Hawaiian Islands and are the only extant species of goose not occurring naturally in continental areas. The Hawaiian goose formerly bred on all or most of the Hawaiian Islands, but currently is restricted to Hawaii, Kauai, and Maui. Preferred nest sites include sparsely-to-densely-vegetated beach strands; shrublands; grasslands and woodlands on well-drained soil, volcanic ash, cinder and lava rock substrates. Females typically nest on the ground and lay an average of 3 eggs. Average weight: M 5.0 lbs., F 4.3 lbs. 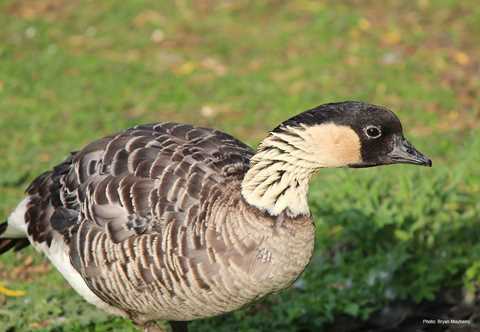 Hawaiian geese have a black face and crown and cream-colored cheeks. The neck is pale grayish streaked with black and has a narrow dark ring at the base. The body plumage and folded wings are gray-brown with transverse barring. The bill, legs and feet are black and the iris is dark brown. Both sexes are similar in appearance, but males typically are larger. 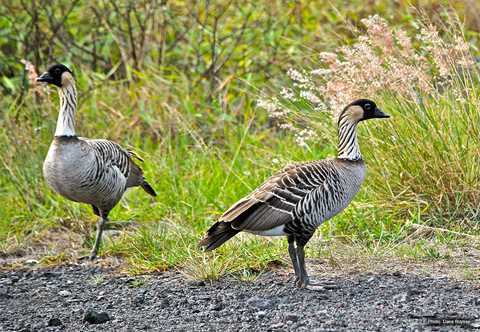 Hawaiian geese graze and browse on the leaves, seeds, berries, and flowers of grasses, herbs and shrubs. 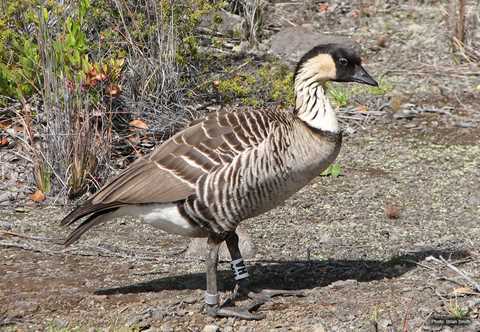 The Hawaiian goose is among the most isolated, sedentary and threatened of all waterfowl. 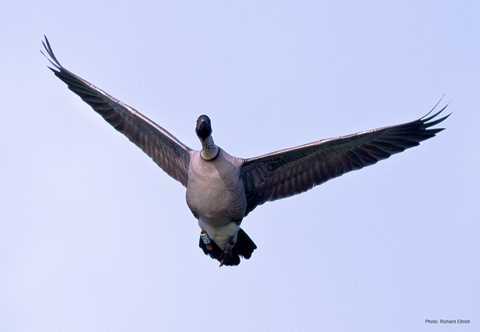 It is the sixth most endangered waterfowl species worldwide. Hunting, egg collecting and predation by introduced mongooses, cats, pigs, dogs and rats contributed to the historic decline of this species. Current threats include scarcity of native food plants, predation by introduced mammals and habitat loss. In certain areas, collisions with vehicles are a major source of mortality. Recovery efforts have included captive rearing and release, predator removal, provision of supplemental food and restoration of native habitats. 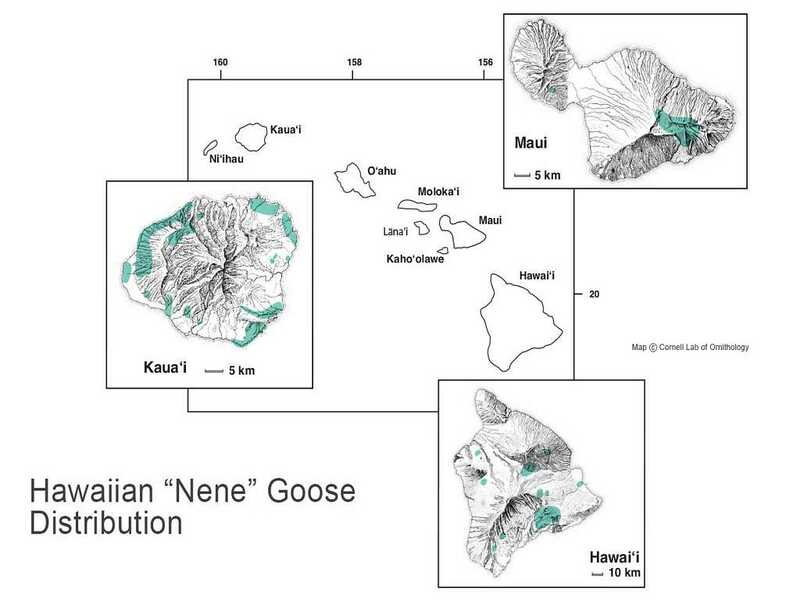 Hawaiian geese are considered sedentary, but, historically, seasonal movements were made in response to changes in food availability as a result of rainfall patterns.